Posted on: September 4th, 2018	by Melanie C. and Jennifer A. Have you been wondering where to go apple picking in New Jersey? September marks the start of my favorite season of the year, fall! Fall is the season for jumping into piles of colorful leaves, grabbing a cozy sweater for a brisk autumn walk, and picking apples from the trees. My family loves it! Apple picking is by far our favorite fall activity. There is nothing quite like going to an orchard and gathering your own crop of apples. My kids love running through the rows of trees, filling our basket with apples. They love eating apples right from the tree and all the yummy things you can make with apples. Apple picking also provides plenty of exercise. It’s a time to enjoy the great outdoors and also it can be a great learning experience. 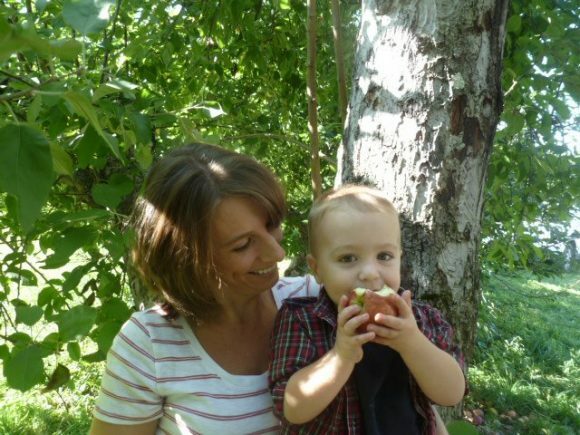 When my preschooler and I pick apples we like to count our apples as we drop them into the basket- instant math lesson! 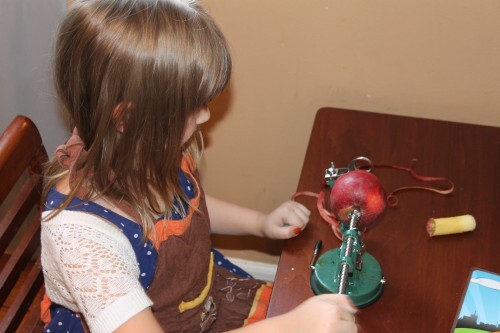 Older kids can guess the weights or compare and contrast the different apples they collect. The great thing about living in New Jersey is that we have so many different apple picking farms to choose from. We’ve created this list of great New Jersey farms with apple orchards where you can pick your own apples. Take a look and find the perfect farm for your family. Hopefully one of these farms will be the perfect place for you to enjoy some “Jersey Family Fun” this fall. If you do visit one of the farms from the list make sure to tell them that you heard about them from Jersey Family Fun. We would love if you post a picture of your family’s apples on our Facebook page and tell us where you got it! 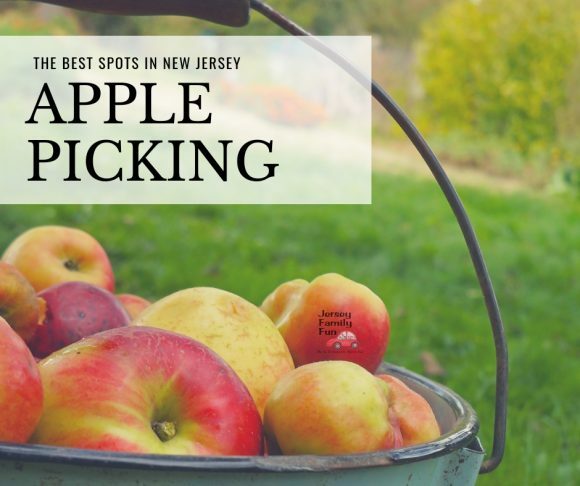 New Jersey apple picking orchards can receive a complimentary listing or an upgraded featured listing by contacting Jennifer Auer, publisher at Jenniferauer@jerseyfamilyfun.com. Demarest Farms located at 244 Wierimus Road in Hillsdale, New Jersey. 201-666-0472. Cost: $7/person general admission, includes activities and a hay ride. $10 for bag to hold the apples. Parks Farms is located at 525 Route 24, Chester, 908-879-5509. Season: Apple picking is expected to run daily from September – October. Farm market open daily May-Late December. Hillview Farms is located at 223 Meyersville Road, Gillette, 908-647-0957. Season: Apples available September and October. Schedule: General store is open daily, Mon-Sun: 9 am to 6 pm, field closes to the public at 5 pm. Tractor rides begin at 10AM. Cost: No admission fee but $5 tractor ride required to get to the orchard. Alstede Farms is at 1 Alstede Farms Lane, Chester, 908-528-8823. Season: Apple picking starts in late August and continues through the end of October. Schedule: The pick your own fields are open 7 days a week. Cost: Pick your own on weekdays is $6.99/person, weekend and holidays $10.99/person. Riamede Farms is at 122 Oakdale Rd. Chester, 908-879-5353. Season: Apple picking starts the first week in September and lasts until the middle of October. Schedule: Apple picking is open daily from 9:00 AM to 4:30 PM. Cost: Pay for what you pick, hayride is free. Stony Hill Garden and Farmer’s Market is located at 8 Rt. 24 Chester, 908-879-2696. Season: Stony Hill opens for apple picking in early September and the season runs through mid-October. Schedule: The pick your own fields are open daily from 10 AM to 5PM. Cost: There is a fee to enter the orchards. After you finish picking apples your family can enjoy the corn maze and other fall activities for an additional cost. Sun High Orchard is located at 19 Canfield Ave. Randolph, 973-584-4734. Season: The apple orchards at Sun High are open in September and October. Cost: Entrance to the pick your own fields is free. You only pay for what you pick. Wightman’s Farm is located at 1111 Mount Kemble Ave Morristown, (973) 425-9819. Season: Apple picking starts in August and goes through October. Call for more information. Cost: $7.00 per person for the entire season (children under 3 are free). You also receive a reusable souvenir tote bag to carry your haul. The fruit is weighed and priced per pound when you exit. Season: Apple picking starts in September and runs through October. Schedule: The farm is open Monday- Saturday from 9:00 AM to 6:00 PM. Cost: Entrance to the pick your own field is free. You only pay for what you pick. Hillcrest Farm and Dairy Orchard located at 2 Davies Road in Frankford, (973) 703-5148. Season: The apple orchard opens in the middle of September and stays open through October. Schedule: They are open on Saturdays and Sundays from 10:00 Am to 5:00 PM. Season: Pochuck starts picking apples at the end of August and continues through October. Cost: $25 for a 1/2 bushel bag (about 20 pounds). Season: Longmeadow opens for apple picking at the end of August and continues through October. Schedule: They are open on Saturdays and Sundays from 9:00 AM to 5:00 PM. Cost: Entrance to the orchard is free. You only pay for what you pick. Season: Mackey’s opens for picking in September. Schedule: Mackey’s is open on weekends from 9:00 AM to 6:00 PM. Cost: A half-peck bag (approx. 5 lbs.) is $7.50. A peck bag (approx. 10 lbs.) is $14.50and a half-bushel bag (approx. 20 lbs.) is $25. The price works out to be $1.50 per pound. Season: Race Farm starts picking apples in September. Schedule: The pick your own fields are open from 9:00 AM to 5:00 PM. Season: The apple orchard at Stoneyfield is open from August to October. Schedule: Stoneyfield’s hours are Monday, Thursday, and Friday from 3:00 PM to dusk, Saturdays from 10:00 AM to 6:00 PM, and Sundays 11:00 AM to 5:00 PM. Cost: You only pay for what you pick at Stoneyfield. Season: The apple orchard is open September and October. Schedule: Tree-Licious is open on Saturdays and Sundays from 9 AM to 6:00 PM. Cost: Pick your own admission is free. You only pay for what you pick. The cost for special events varies. Bonacorsi Family Farm is at 1137 Croton Road, Flemington. Schedule: The pick your own fields are open 7 days a week from 10:00 AM to 7:00 PM. Season: Apple picking starts in mid September and continues through the end of October. Schedule: The pick your own fields are open 7 days a week from 9 AM to 6 PM. Cost:$1.59 per pound when you pick more than 10 pounds and $1.99 per pound when you pick less than 10 pounds. Season: Apple picking starts in September and continues through the end of October. Schedule: The pick your own fields are open 6 days a week (closed on Tuesday). Season: Apple picking is August-October. Cost: Picking requires a $2 membership good all season as well as a $5 deposit refundable to your purchase. Season: Apple picking is September-October. Season: Apples are early September to Columbus Day. Cost: Admission to the farm is free. Schedule: Hours are 10 am – 5 pm. Cost: Admission fees vary by day; attractions are not available weekdays. Cost: Apples are $1.89/pound admission is free. Photo provided by Johnson’s Locust Hall Farm. Visit Johnson’s Locust Hall Farm online at www.JohnsonsLocustHallFarm.com. Johnson’s Locust Hall Farm in Jobstown is a Pick Your Own Family Fun Farm, picking sunflowers in early September & Apples & Pumpkins Daily September-October. Hayrides transport guests to the pumpkin picking fields, apple orchards, Sunflower Walking Trail (September) & 5 acre Family Corn Maze. Apple picking is open 7 days a week (September-October) Hayrides ($4.50 per person) out to the orchard are available 10-4 pm Weekends & 11-4 pm Weekdays. Weekends celebrate the fall harvest with Live music, grill, Tomasello Winery & fun for the whole family (September-October). Johnson’s Locust Hall Farm is located at 2691 Monmouth Road, Jobstown. 609-353-9000. Season: Picking starts September 8. Cost: Apples are $1.89/pound, Pumpkins 79 cents/a pound. Johnson’s Corner Farm is located at 133 Church Road, Medford. 609-654-8643. Season: Hayrides to apple picking (additional cost) operate from September 8 – October 14. Schedule: Friday-Saturday in September, Friday-Monday in October, 9AM – 5 PM. Cost: Apples $1.39/pound, $3.50 wagon ride to the fields is required. Stiles Farm is located at 172 South Delsea Drive, Cape May Court House, (609) 600-7939. Season: Heritage Vineyards opens for apple picking in October. Schedule: 10AM – 5PM, Saturdays and Sundays October only. 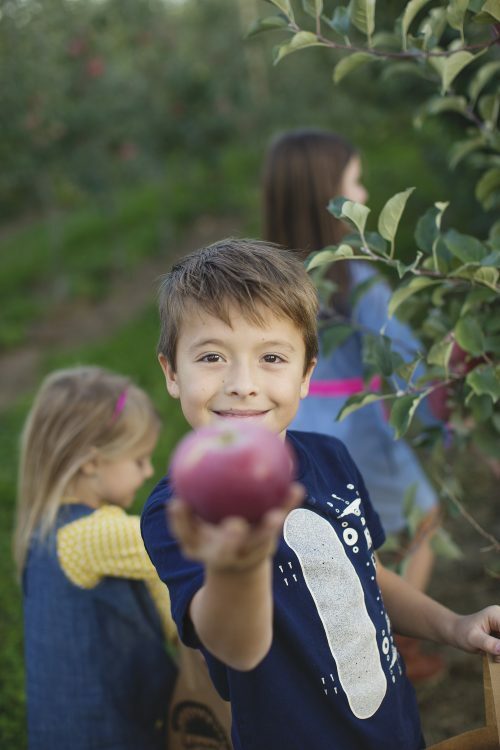 With so many farms nearby to choose from, your family is bound to pick apples that will last months! One tip before you head out: many apple orchards do not take credit cards. Be sure to check out the farm’s website before you leave and make sure you have cash if needed. 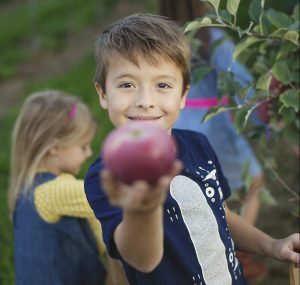 After picking apples in New Jersey you’re going to want to check out these great apple recipes, books, and crafts. 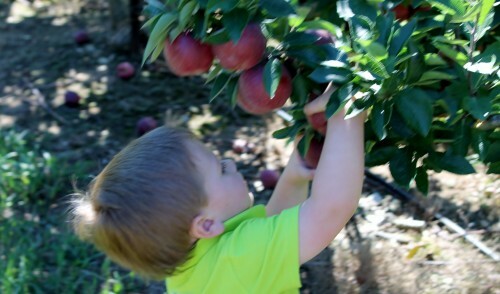 Great find Jenny, we’ve added Russo’s to our apple picking and corn maze listings!